The cake or ball of blue should be tied in a flannel and then dissolved in the water by crushing it with the fingers; when sufficiently coloured the water should be sky-blue when held in the palm of the hand. Where can you buy laundry blue? Thank you to everyone who's asked about suppliers of laundry bluing. This list of sources of various kinds of washing blue - liquid, solid, or powder - online should help. If you have any other suggestions, do let us know. Please read any instructions on the product carefully. Remember both powder and solid lumps may cause blue smears or specks if used incorrectly. All kinds, including liquid, need to be used at the right concentration. Solid blue always used to be tied in cloth, or put in a bag, and mixed into rinse water by hand; traditional advice says the rinse water should look "sky blue" and the blue bag should be made of thick flannel. It isn't suitable for front-loading washing machines, and you would have to invent your own way of using it in a top-loader. Liquid bluing is quite easy to buy in the US. 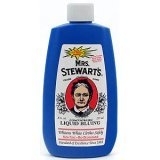 Mrs Stewart's bluing - on sale at some Wal-Marts, also stocked by other stores selling laundry products. One reader told me (thank you!) she found it at Weis Market, or you can order it from Amazon . 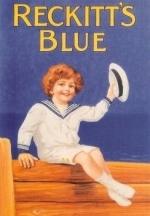 Bluette - There used to be information online saying that this was "sold in the detergent or bleach aisle of most supermarkets and many smaller grocery retailers in the New York area. It is not widely distributed outside of the Northeast" - but that page is no longer there. (May 2009) Scroll down for a link to buy it online. Hope some of the US or European ideas will work for you. Solid cubes of Reckitt's blue sold by the Carbolic Soap Company - also eBay, as above under "USA". Both solid and liquid bluing can be ordered from the USA via Amazon - check the shipping charges. Powder blue from Ossiversand - see link under "Germany and other European countries". You may find Robin liquid or powder blue in shops with a lot of supplies imported from the Indian subcontinent. Powdered ultramarine blue made in Germany (Waschblau or wash-blue) is available, but the English language webpage I used to suggest has gone. Please let us know if you can help with this. German language sources of Schneeberg powder blue include Manufactum - also sold on their Swiss website. Liquid bluing is made in Spain (azulete) for La Nave - sorry, no definite info on where to buy it - possibly in some supermarkets. Liquid and solid blue may be ordered from Amazon and eBay (see above). Ebay, Amazon.com and Ossiversand (see above) are our only suggestions. Please email if you know better. Laundry blue is widely sold in liquid and powder forms under the brand names Robin and Ujala.